The implementation of the new PA rig, comprising six hangs each of 12 K2 variable curvature enclosures, together with three K1-SB subs flown behind each array, is the final step in an upgrade process that began with the installation of one of the largest center-hung HD video scoreboards in an indoor arena in the U.S. 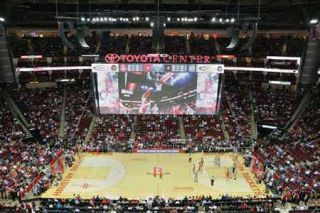 The Toyota Center, home to the NBA’s Houston Rockets, recently completed a major makeover of its installed AV systems with the addition of an L-Acoustics K2 sound system. The implementation of the new PA rig, comprising six hangs each of 12 K2 variable curvature enclosures, together with three K1-SB subs flown behind each array, is the final step in an upgrade process that began with the installation of one of the largest center-hung HD video scoreboards in an indoor arena in the U.S. According to Kevin Broussard, sales engineer with AV systems integrator LD Systems in Houston, TX, “About two years ago they embarked upon an upgrade to their video experience.” Manufactured and installed by Panasonic, the video scoreboard measures 58 feet wide by 25 feet wide along the east and west seating areas and 25 feet square at the north and south ends. The multipurpose sports and entertainment arena, opened in October 2003, seats approximately 18,000 for basketball games and 19,000-plus for concerts. “This past year, the objective was to improve the audio to match current technology. The ultimate goal was to give the fans the best experience,” said Broussard. LD Systems proposed an L-Acoustics system, having been standing behind the brand for some years now, he said. “We’ve had some pretty great success with several installations with their products, with the ability to design something within the [L-Acoustics] Soundvision software, and then actually put it into the space and have it be extremely predictable. That’s something that we love about their systems.” The design was created in partnership with L-Acoustics and project consultant WJHW. The six flown arrays—two each down the east and west sides and one at each end—provide even coverage, Broussard said. A total of 29 LA8 and two LA4 amplified controllers power the system. “With the new K2 system having a 10-degree inter-cabinet angle, we’re able to achieve a very uniform coverage from the bottom to the top of the bowl with a minimal number of boxes. One of the goals of the installation was to provide as little overlap between cabinets as possible to eliminate any kind of phasing or phase cancellation and to minimize reflections. Given that the K2 is such a high-powered box, with its now wider dispersion ability, we were able to get a very high-impact, high-SPL system with a reasonable number of boxes,” he said.